When it comes to pastries, Italy has a lot to teach to other countries in terms of traditional recipes. Among them, the famous Saint Joseph’s Fritters, the zeppole, one of the most amazing recipe in the Neapolitan cuisine. If you’re from the US, you’ve probably seen the zeppole in many Italian shops around the 19th of March and you’ve surely recognized them thanks to the particular shape, the filling and the cherry on top; sometimes also the fried donuts Italian style are called zeppole but the original ones are these, prepared for the 19th of March, the day of Saint Joseph, Maria’s husband, as well as father’s day in Italy. The zeppole were invented by monks at the beginning of the 19th century and since then they’ve reached the status of recipe to be preserved to celebrate the Italian tradition. 1. Pour water into a saucepan with salt and butter. Bring to a boil, always stirring then add the flour mixing well using a metallic spoon until the batter is smooth and no longer sticks to the sides of the pan. 2. Let the batter cool then once it’s in a room temperature add eggs, sugar, baking powder and vanilla extract. Mix everything together with a mixer until it’s light and smooth. 3. Prepare the filling by boiling the milk with the lemon peel and in the meantime beating the egg yolks with the sugar. Once the yolks and the sugar have formed a smooth cream add the flour and mix gently. Once the milk starts to boil, remove from the stove and add the eggs’ mixture whisking continuously. Put the pan back to a low heath and let the cream cook, always stirring, until it become dense. Transfer the cream into a bowl, cover with some plastic wrap and let it cool. 4. Cut out a few squares of aluminum foil and grease one side of the squares with extra virgin olive oil. Fill a pastry bag with the batter and form a ring of dough on each foil forming a spiral. 5. Heat the frying oil and, when it’s hot, place the fritters in the oil with the foil and let them cook. The foil will separate from the zeppole and the zeppole will be ready when lightly brown on the outside and fluffy on the inside. 6. 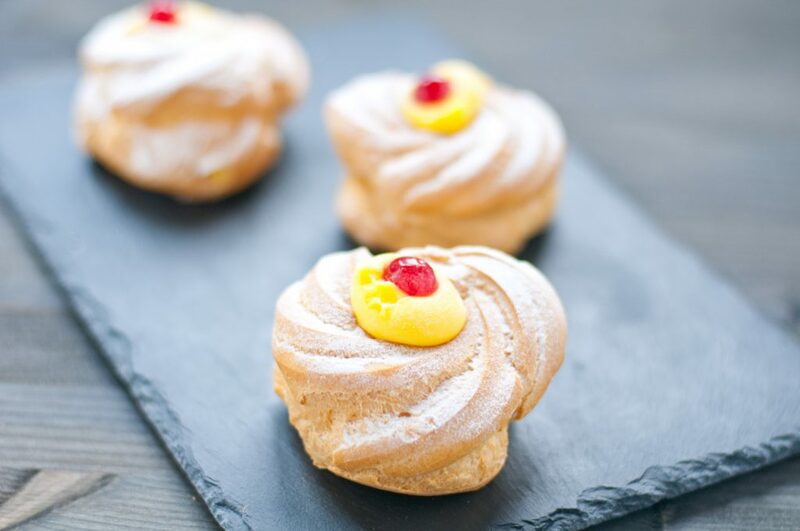 Once the zeppole are cool, fill them with pastry cream and decorate with a cherry on top. Sprinkle with powdered sugar and enjoy. If desired, you can vary both the base and the filling by choosing cocoa, pistachios or dried fruit, jam and so on. According to tradition, the Neapolitan zeppoles were born in the convent of Santa Patrizia or in that of San Gregorio Armeno (and originally where filled with cinnamon and sugar) and were codified for the first time in the recipe during the first half of the 1800s although they were probably also prepared earlier. In fact, already in 1700 March 19, the friars to pay homage to their patron saint, St. Joseph precisely, began to set up banquets outside their shops where they prepared and distributed the zeppole to passersby, stuffing them with an amarena. It is also said that at the beginning of 1900 the confectioner Pintauro decided to start to fry his St. Joseph’s zeppole on the sidewalk in front of his shops, to compete with the improvised fry and allow the Neapolitans to taste a dessert made in order to ‘art. 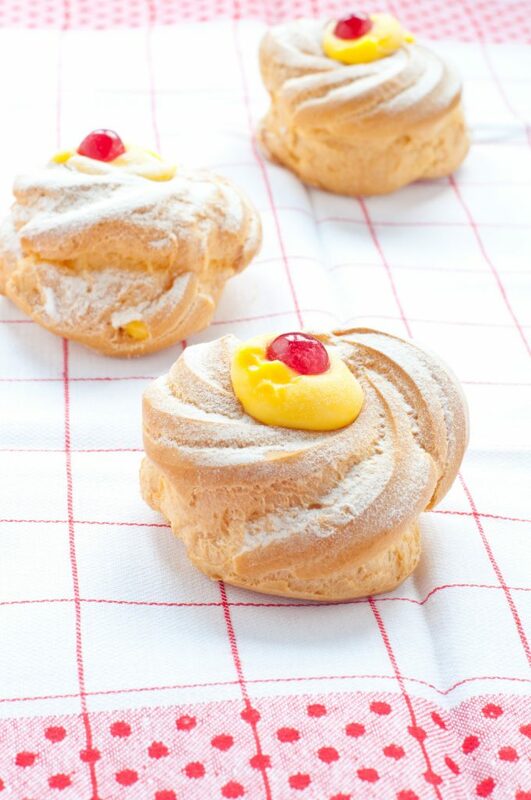 Even today, Pintauro is considered the pastry to be frequented to eat what are considered by many to be the best zeppole of San Giuseppe.